Welcome to the land of vast deserts, striking coastlines, and a rich cultural heritage. 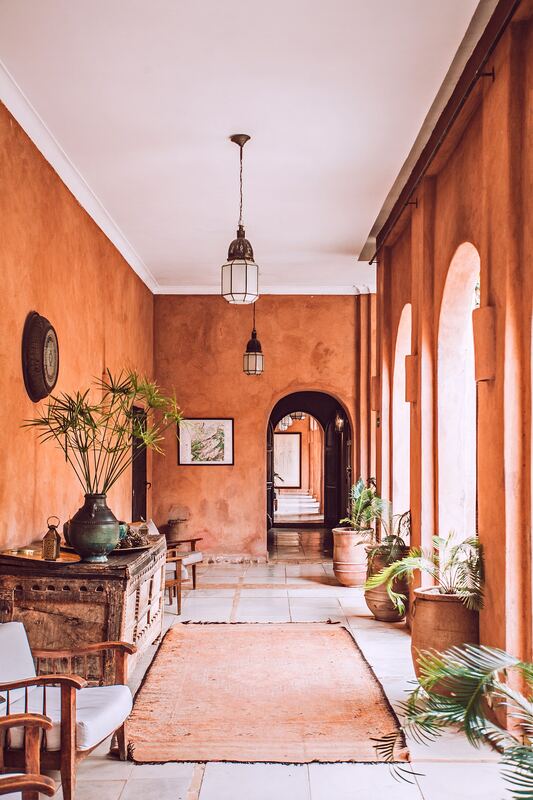 From the minute you step off the plane in Morocco, you'll be immersed in its colorful sights, exotic aromas, and the bustling sounds of the city. With a comfortable climate year round, Morocco is a destination for any season. However, for anyone interested in exploring this North African gem, off-season (January - February) is an excellent time to visit, with fewer crowds and discounted prices. A Morocco guide culture, nature, activities, ocean, and party. Morocco is truly a country for every type of traveler and offers exciting activities for any taste. So, whether you identify as an Active Naturist, Chill Naturist, Oceanist, Culturist, Party Purist, or even a mixture of all the above, you’ll find thrilling and unique ways to spend your time in Morocco. Trekking - Venture on a multi-day trek through the famous Atlas Mountains, camping in remote Berber towns while learning about local life and exploring the stunning alpine landscapes. 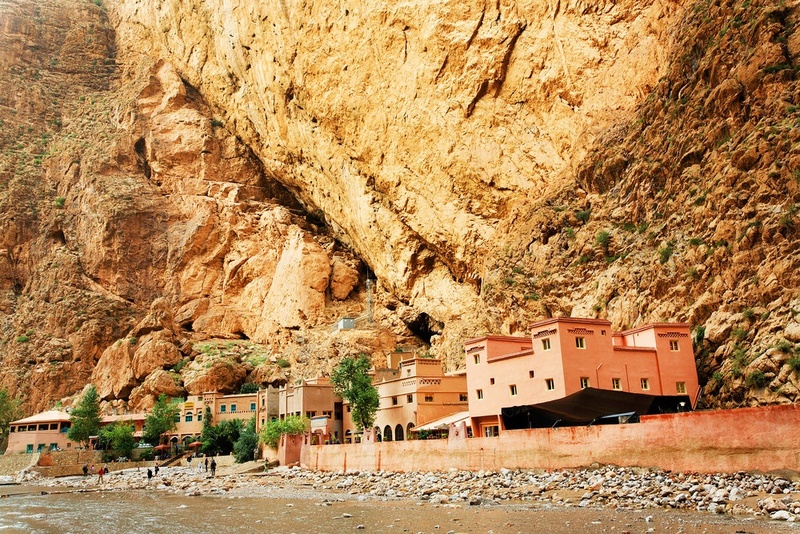 Rock Climbing - The Todra Gorge offers hundreds of different routes, making it the perfect place for experienced, as well as beginner, climbers to discover Morocco’s wilder side and scale the giant crimson-tinted limestone walls. Sandboarding - Visiting the desert dunes is a must for any traveler visiting Morocco, but why not take it to the next level? Adrenaline lovers should not miss boarding down Merzouga’s towering sand dunes, reaching speeds of up to 50mph while immersed in the other worldly scenery of the Sahara. Waterfall Hikes - Check out Ouzoud Falls about 100 miles northeast of Marrakech, or Cascades d'Akchour near Chefchaouen for some of the country’s most stunning waterfalls. Easily reached on a leisurely day hike, delight in the incredible views while cooling off in the turquoise pools under the falls. 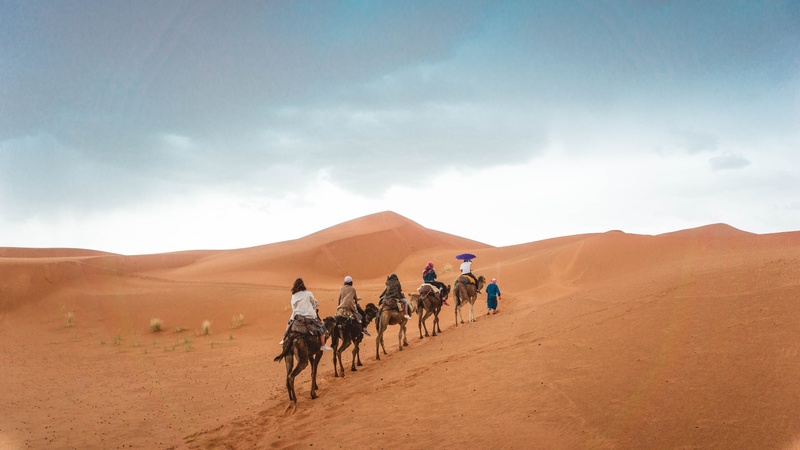 Camel Ride - While there is no shortage of camel ride offers throughout Morocco, nothing compares to riding through the rolling sands of the desert on camelback while passing by tranquil oases and marveling at the vast desert. Botanical Gardens - Majorelle Garden in Marrakesh is a magical escape from the bustling city and provides visitors with a tranquil place to wander along picturesque pathways lined with exotic plants and colorful Moorish architecture. 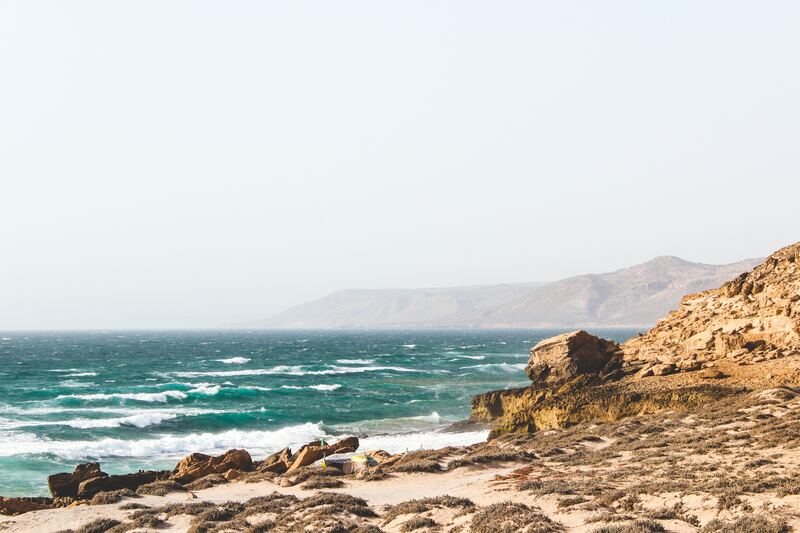 Beaches - Venture to Morocco’s Atlantic coast and relax along the shores of Sidi Kaouki, a sleepy beach town known for its laid-back atmosphere and friendly locals. Or, for something a bit different, head north to Saidia on the Mediterranean, a favorite Moroccan vacation spot. Surfing - For those in search of more than a few lazy days on the beach, both Essaouira and lesser known Taghazout are famed as the country’s premiere surf spots. The waves here are great for advanced surfers as well as beginners, who can take advantage of the many top surf schools in the area. Horseback Riding - If admiring the sea from a distance is more your idea of a beach holiday, try switching things up a bit with a journey on horseback along the shore. Rides are offered in any major beach town and are an ideal way to take in the dazzling ocean views. 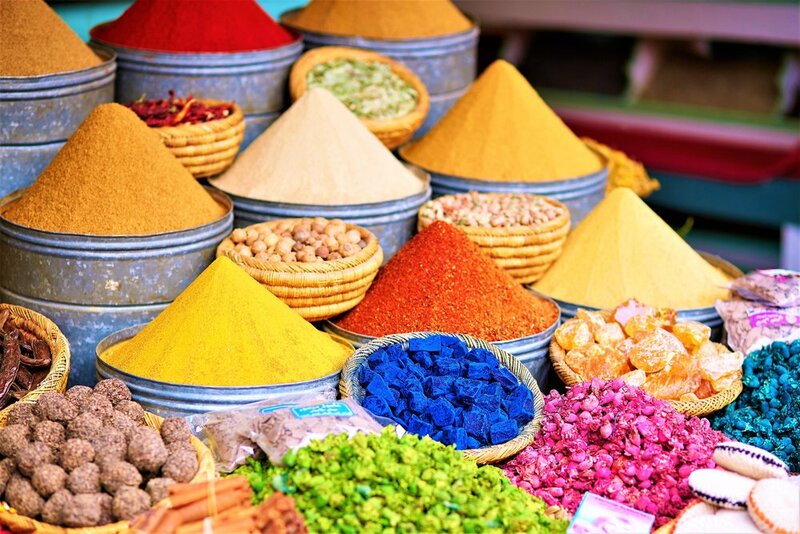 Cooking Class - Dive headfirst into Morocco’s lavish traditional cuisine and try your hand at cooking up some of the country’s most delicious dishes such as tajine, pastilla, and couscous. Hammam - Live like a local and experience a Moroccan steam bath where you’ll have your skin scrubbed, hair washed, and body massaged. Not for the modest, a hammam session may take you out of your comfort zone, but is sure to leave you feeling rejuvenated. It doesn’t get much more authentic than this! Shopping - Featuring a diverse selection of textiles, spices, pottery, and so much more, visitors must spend at least one day wandering through the narrow alleyways of the medina haggling with vendors and discovering exotic treasures. Nightlife - Although Morocco prohibits alcohol consumption in sight of any mosque, you can still find plenty of bars and clubs selling drinks. This gives Morocco’s nightlife somewhat of a “speak-easy feel”, making it an exciting and unique experience. One of the country’s most lively areas can be found along Avenue Mohammed V in Marrakesh. 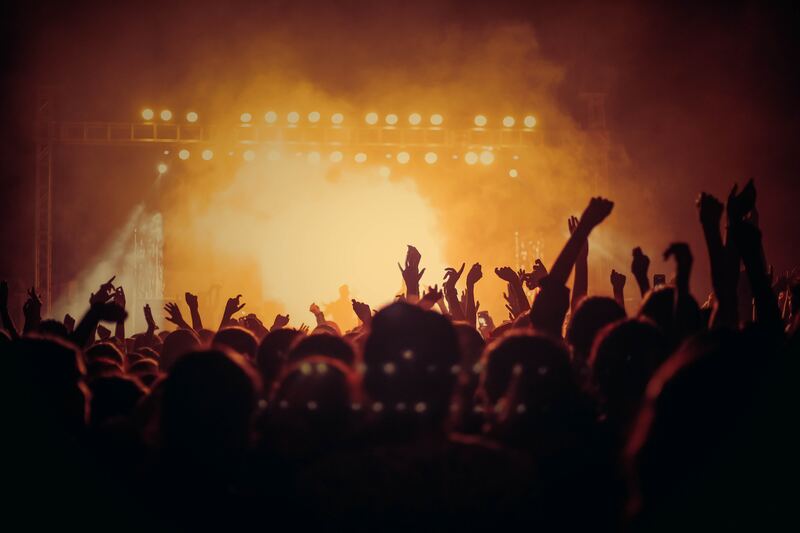 Music Festivals - It may come as a surprise, but Morocco has made a name for itself in recent years as a hub for all kinds of music festivals, especially electronic. Fans of this genre should be sure not to miss “Oasis”, boasting an iconic lineup in a one-of-a-kind location. Belly Dance Show - For a more traditional night, head to a shisha bar and relax on a bed of pillows while sipping mint tea and enjoying an alluring belly dance show. With so many options, it’s easy to fill your days (and nights) with novel adventures in Morocco. Whether you decide to discover the intricacies of the local culture, traverse the mountainous landscapes, or dance the night away, Morocco is a country that needs to be on everyone’s bucket list!